When I visited a supermarket, some years ago, I saw the price of tomatoes. I could not believe my eyes……€ 10,25 per kg and the quality was not even good ! But… I was in Ivory Coast and the tomatoes were imported from Europe. I was curious for the reason and I eager to understand why vegetables were imported after which it is only available for the small group of people who can afford it. 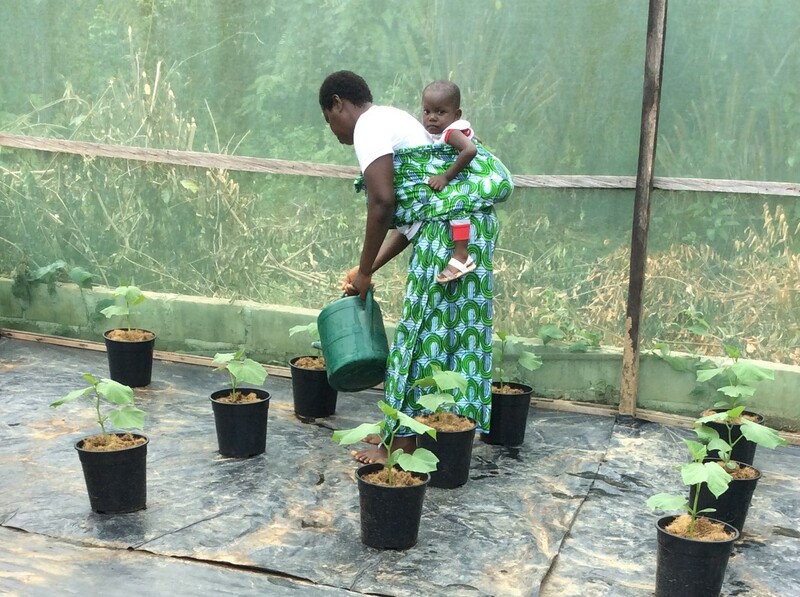 They don’t grow vegetables in Ivory Coast ? 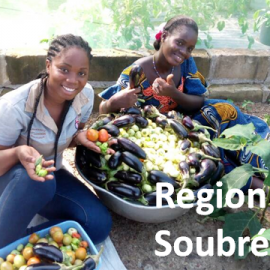 Actually, they do grow vegetables in Ivory Coast but the results are often disappointing, due to problems in the soil (diseases, bacteria, nematodes etc.) which are difficult to fight as well a climate which is not ideal for the cultures. 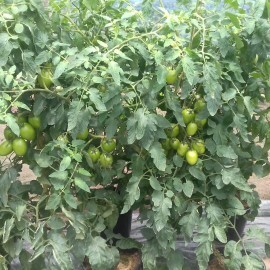 Therefore we started a test with the culture of tomatoes on substrate (hydroponic) in the way we use for a long time in other countries. The plant is not planted in the soil but in a pot with a (local) coco-substrate. 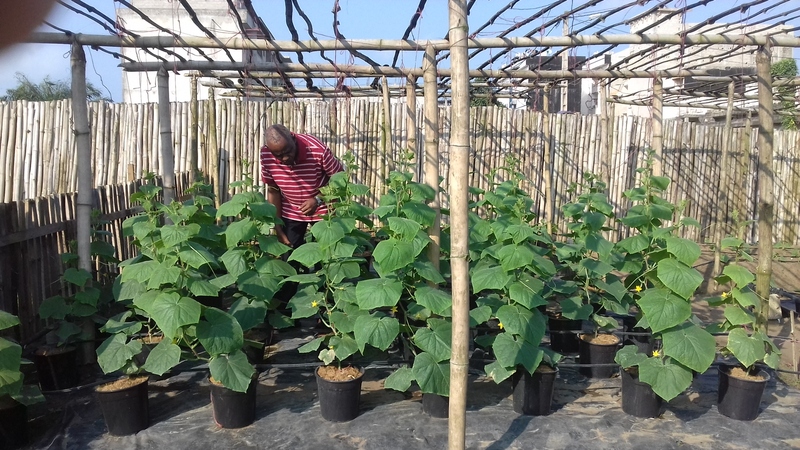 The advantage is that you start with less problems and even more important: you can “steer” the plant much better for a much better result (bigger harvest and higher quality). Because I was not very often in Ivory Coast, that time, I had to give very precise instructions because the responsible man had no experience with this way of growing. 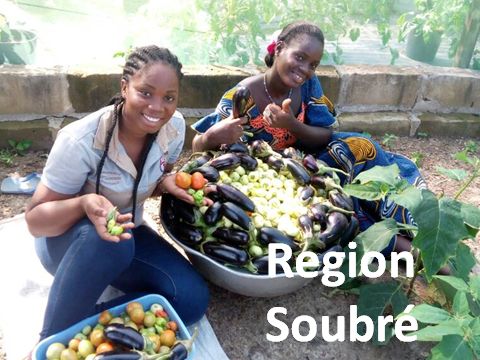 I can say: the results were maybe not as good as I wanted but impressing for the growers in Ivory Coast. After this test, I was convinced that growing on substrate could be a solution but: how to start ? where to start ? 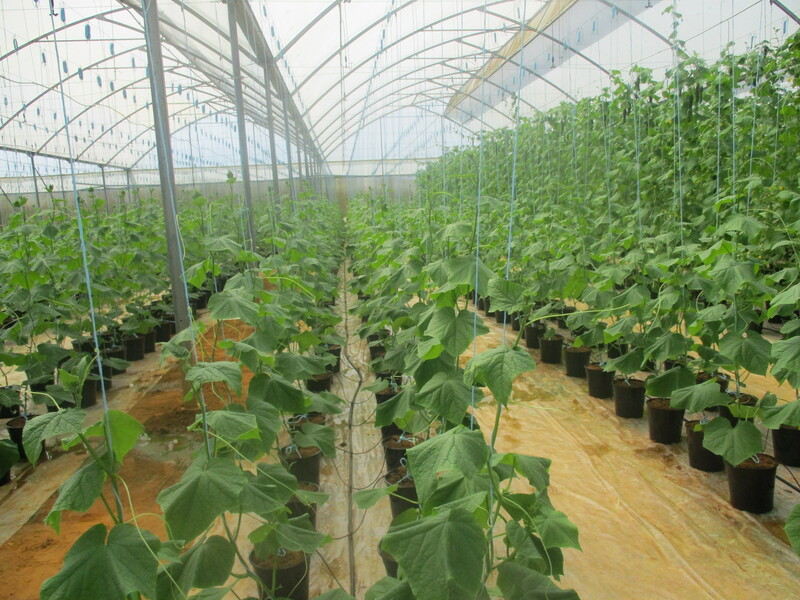 – Less waste of water (60-75% of the irrigation water is spoiled in the regular way of growing). 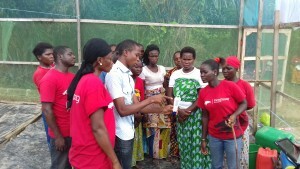 – Less pollution of the soil and groundwater, therefore. – A higher production per m2. 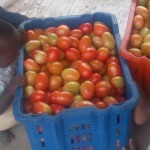 – Better quality and shelf life of the vegetables. You can call this durable in many ways. 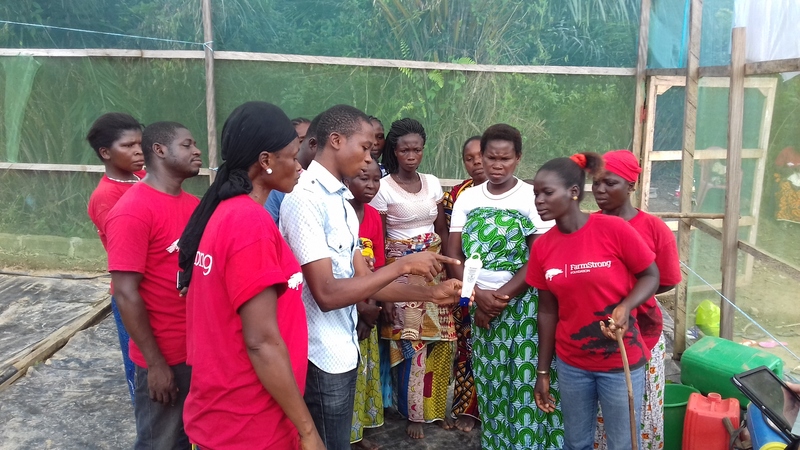 – Fertilisation has to be much more precise; by fertilising in an optimal way, the harvest will be much better but…..you should not forget irrigation one time and you should not irrigate with the wrong fertiliser several times because this could be the end of the culture. 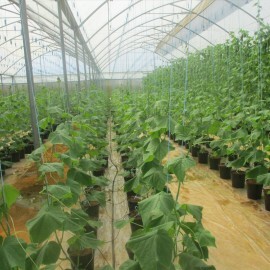 – The investment is higher; you need a good irrigation system, you need pots, a good substrate, etc. 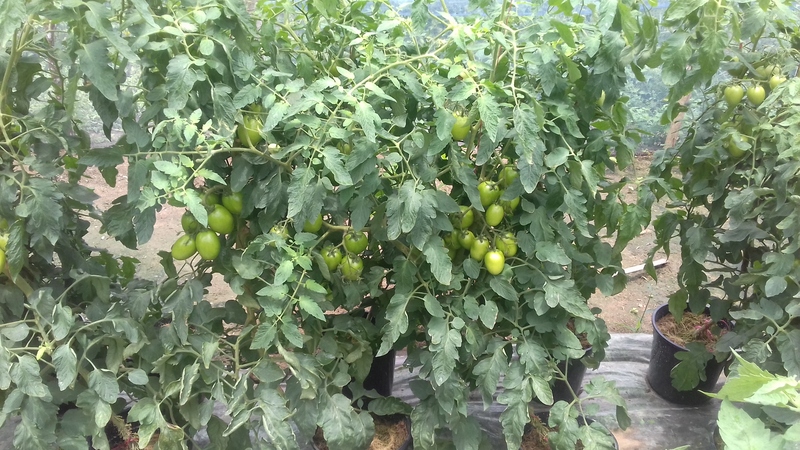 – The fertilizers have to be very well balanced according the need of the plants; the minerals have to be dosed in the correct relation for a good result. My conclusion was: There is really something to do here but the grower needs good materials, good fertilisers and especially: a very good and clear users-manual. Because: to get better results the way of working has to be changed ! To make it feasible and understandable, we created a concept: buy the right materials from AGRIFER and we will give you a manual in which the culture is explained step-by-step. A very easy way which will give a better result if it is followed up in a serious way. Our first step was to see and to prove that this concept works. 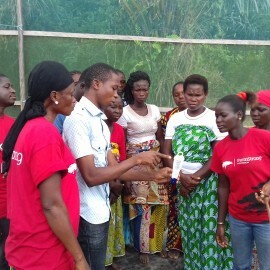 We can proudly say that we found very good results, as well with small women groups (in the cacao-areas with the Farmstrong Foundation http://www.farmstrong-foundation.org ) as with cooperatives as with big growers; the results were often 5-8 times higher than reached with the regular way of growing in the soil. 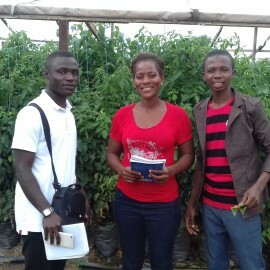 On our own nursery, where we do trials for Rijkzwaan, an important seed-producer (www.rijkzwaan.com) , we also give training to the new growers. So besides the theory also there is a chance to meet the praxis/reality. Thereby our advisors go to give advice on the sites of our customers which can be found all over Ivory Coast now. 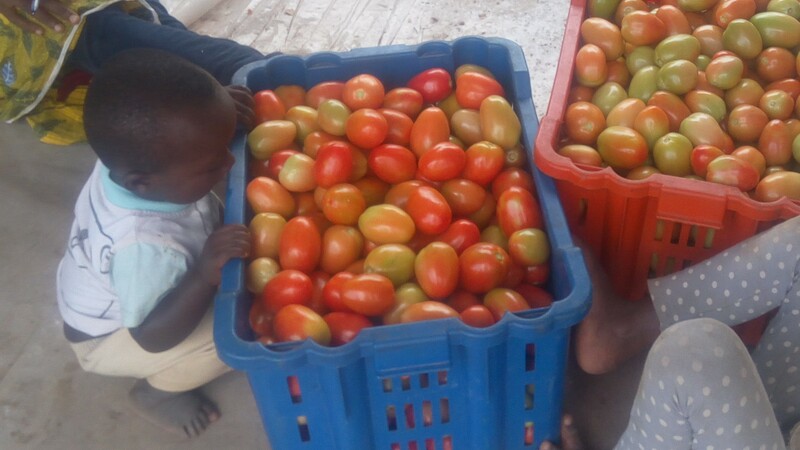 We know the problems in Africa: the production is too low for the (fast growing) population and it seems easier to import (often subsidised) vegetables than to invest in knowledge and experience. We feel there is a big responsibility for the governments here; they have to stimulate the local people and help them with an investment in knowledge and experience. Problems don’t solve themselves ! We all saw the development in Asia: since the sixties governments there invested especially in agriculture, the best way to develop is to find in the primary sectors, as we experienced. 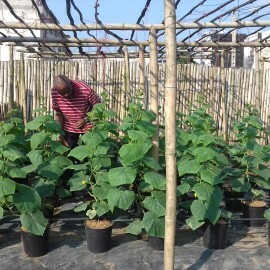 We are convinced that a stimulation of agriculture will help Africa and we believe it is really time to invest now ! 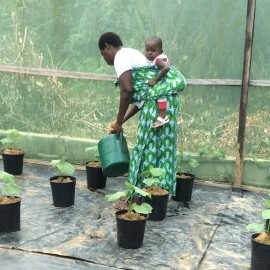 Back to the development of horticulture in Ivory Coast. Why should we invest time and money in this ? 1) Improvement of the diversity of food for the people. Manioc really does not contain all minerals and vitamins we need. 2) Improvement of employment opportunities. Wasn’t there this AFRICA-EU summit, end of last year ? 3) Improvement of the economy of Ivory Coast. Better to produce ourselves than import. One of the problems we find here is a lack of pragmatic schooling. Students leave school after 2-4 years, the high school or even university with their head filled with theoretical information. Unfortunately they never had the chance to match this theory with the praxis. Even worse: probably also their teachers never had the chance. We feel this is one of the opportunities that AGRIFER wants to give; after school an internship is obliged but – unfortunately – difficult to find. 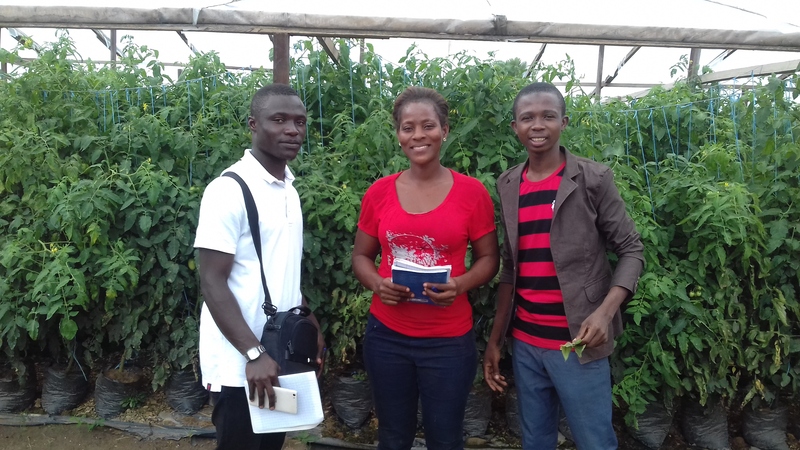 We take students for an internship and – if the student is enthusiast, curious and eager to help us to develop, we give an internal training after which he might become an adviser for AGRIFER or maybe a manager for a customer. Because also that is one of the problems here: to find competent managers with knowledge and experience. Our goal is to bring praxis and theory together, sometimes we start from zero again but than in a pragmatic way. However I think we have to start with the young people: good education, practical education, diplomas of competence (earned, not bought). We need enthusiastic young people who help their own country to develop, young people who are proud on their country and the company they work for. It costs energy but with the right stimulants it is possible !